Come for the first time or return again to Navarre Beach , and enjoy its signature; uncrowded beaches and sugar-like, white sands. This large townhouse offers an unobstructed Gulf of Mexico view from the front and a Santa Rosa Sound sunset view from the rear. 'Sea Breeze' is immaculately clean and fresh and is professionally decorated with quality furnishings, supplies, and linens. Less than 250 feet from the beach, Sea Breeze is directly across Gulf Boulevard from a public beach access. Balconies off each room extend the coastal view even more. A great family vacation awaits you in Florida's best kept secret- Navarre Beach. 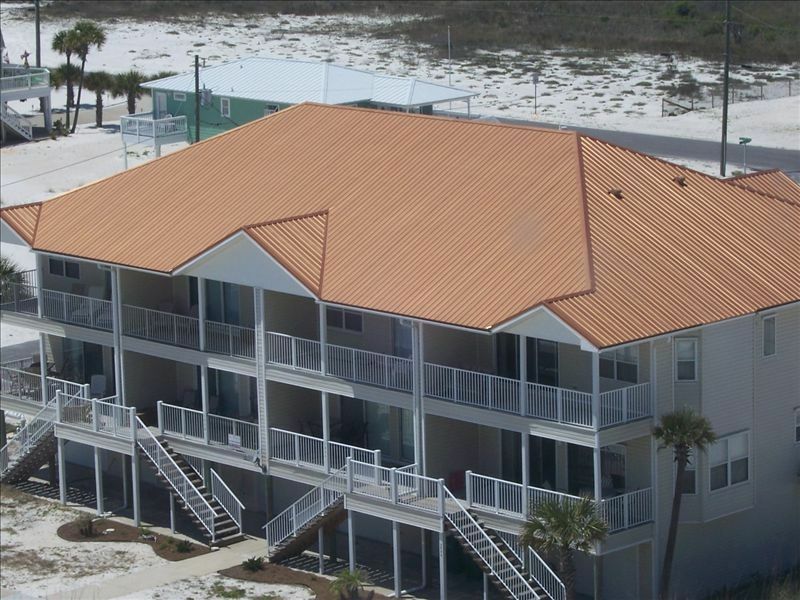 Sea Breeze's 2200 square feet features three plus bedrooms and three baths on three levels. The master bedroom has a king-size bed plus a large dressing area and master bath suite with jetted tub. A second bedroom on the lower level has a king-size bed. The third bedroom is designed as a family sleeping room with two queen-size beds. A full size bed convertible futon is in the bonus room. Bedding supplies for the futon are located in the Queen BR closet. All combined, Sea Breeze can sleep eight people comfortably. Maximum occupancy is 10. The ground level offers an enclosed, two-car, tantalum garage (one behind the other) for easy access and security. 2 parking spaces are available outside near the foyer entry. Extra car or boat and trailer parking is 150 feet nearby at the corner of Indiana Street and White Sands Blvd. The entry foyer is a great place to store beach toys and towels. The main living area is one level up and features a great room (kitchen, family room, plus dining) with a great view of the Gulf. One of the Queen bedrooms and a bath is on this floor. The upper level has the master bedroom and bath, the family 2-queen bedroom, bonus room with full size sleeper futon and a third full bath. Fully outfitted kitchen for the family who cooks together. Fellowship building and budget friendly. We enjoyed the house and the beach was spectacular!! The house was perfect for my family with three kids as well as my friends family with her three kids! We wish there was a pool since the ocean was cold but I would be willing to stay there again :) Tom was great and always responded fast to any questions I had! I went with a group of friends on spring break. We were amazed with how nice and clean it was! There wasn’t a speck of sand in the house, which I’ve found is unusual for beach houses. The house had any toy or activity you could’ve wanted on the beach including corn hole, wake boards, and boogie boards. The master bedroom and bathroom was spacious and comfortable and the other bedrooms were equally comfortable. The kitchen was roomy and had any pot, pan, or utensil you could’ve needed with a grill in the garage. The owner made sure we were able to check in successfully and were happy and comfortable during our stay. He even went above and beyond and gave us restaurant suggestions when I asked. We had a great time and would consider staying here again. The property was perfect with everything you could possibly need. Hurricane Michael ran us out early, but we plan on going back again soon. Tom was great to work with. I highly recommend it! This is a great place to stay! The house is in a great location. The ocean is visible from the front of the house and the gulf from the back! The beach access is great! We saw dolphins, sea turtles, crabs, and fish. There was a beautiful sunrise and sunset every day. Had a great time. Right across from the beach. Kitchen was well stocked and house was roomy. Would definitely stay again. We had a blast on the beach. The men took a day and went deep sea fishing while the kids stayed at the beach. This was one of the best family vacations we have ever had. The owner was great and the place was set up for family fun. I greatly appreciate the detailed feedback on your stay. As a first time visitor to SeaBreeze, we work extra hard to make sure your visit is positive and memorable with a desire to return again year after year. Your family is welcome back anytime. Thanks for the great care of our house!